Dennis Brian Erickson (born March 24, 1947) is the head football coach, for the Salt Lake Stallions of the Alliance of American Football league. He was the head coach at the University of Idaho (1982–1985, 2006), the University of Wyoming (1986), Washington State University (1987–1988), the University of Miami (1989–1994), Oregon State University (1999–2002), and Arizona State University (2007–2011). During his tenure at Miami, Erickson's teams won two national championships, in 1989 and 1991. His record as a college football head coach is 179–96–1 (.650). Erickson was also the head coach of two teams in the NFL, the Seattle Seahawks (1995–1998) and the San Francisco 49ers (2003–2004), and tallied a mark of 40–56 (.417). Erickson retired on December 30, 2016, after 47 years in coaching. In 2018, the AAF named Erickson as the head coach of the Salt Lake Stallions, bringing him out of retirement. Erickson was raised in Ferndale, Washington, 100 miles (160 km) north of Seattle, and in Everett, 25 miles (40 km) north of Seattle. His father, Robert "Pinky" Erickson, was the head football coach at Ferndale High School and later at Cascade High School in Everett. The younger Erickson played quarterback at the rival Everett High, coached by next-door neighbor, Bill Dunn. This "made for some quiet dinners on game day." As a junior, Dennis was the starting quarterback, beating out the former starter, senior Mike Price, another future college head coach. Price, the son of the head coach of Everett Junior College, was moved to defense as a safety. When Erickson left Washington State for Miami in 1989, he recommended Mike Price (who got the job) as his replacement and rented Erickson's Pullman home. Erickson had beaten out Price for the Washington State job in 1987. Six years earlier in 1981, Price had beaten Erickson out for the job at Weber State College in Ogden, Utah. While at Idaho, Erickson was 2–2 in conference play against Price's Weber teams, and at Oregon State, he was 2–1 against Price's Washington State teams. Erickson graduated from EHS in 1965 and accepted a football scholarship to Montana State in Bozeman to play for head coach Jim Sweeney, and was a member of the Sigma Alpha Epsilon fraternity. He was an effective undersized quarterback from 1966 to 1968, earning all-conference honors in the Big Sky. Immediately after his senior season, Erickson began his coaching career as a graduate assistant for the Bobcats in 1969. In 1970 at age 23, he was the head coach at Billings Central Catholic High School, staying for just a single season. From 1971 to 1981 Erickson was a college assistant coach, working with the offense. Beginning at his alma mater, Montana State University, in 1971 under Sonny Holland, he became an offensive coordinator in 1974 at the University of Idaho under newly promoted head coach, Ed Troxel, and stayed for two seasons. Erickson's college coach, Jim Sweeney, resigned from neighboring Washington State after the 1975 season. He then moved to Fresno State in 1976, and Erickson followed him to be the offensive coordinator for Sweeney's first three seasons. When Jack Elway, a former Sweeney assistant at Washington State, was hired at San Jose State in 1979, Erickson joined him for three seasons, again as the offensive coordinator. They instituted the spread offense, which Elway had picked up from his son John's high school coach, Jack Neumeier. Erickson was a finalist for the Weber State job after the 1980 season, but lost out to his high school teammate and friend, Mike Price. Erickson would finally get his head coaching chance following the next season. Erickson's head coaching career began at age 34 at the University of Idaho. He was hired on December 11, 1981, to succeed Jerry Davitch, who had been fired nine days prior to his final game (a one-point home loss against rival Boise State). A pre-season playoff pick, Idaho finished the disappointing 1981 season with six consecutive losses, and were winless in seven games in the Big Sky. Erickson was hired by UI athletic director Bill Belknap and accepted a one-year contract at $38,001. His most notable recruits at Idaho were his quarterbacks - future NFL head coach Scott Linehan, who had future Oakland Raiders head coach Tom Cable blocking for him, and future College Football Hall of Famer John Friesz, who had Mark Schlereth blocking for him. Erickson revived Vandal football and quickly turned it into a top I-AA program, whose success was continued for another decade by former assistants Keith Gilbertson (1986–88) and John L. Smith (1989–94). Before 1982, the Vandals had posted only four winning seasons in over four decades, and had not had consecutive winning seasons since 1938. Idaho had three consecutive winning seasons only once (1903–05), and never had four. With Erickson's arrival as head coach, the program embarked on 15 consecutive winning seasons (1982–96), and 11 trips to the Division I-AA playoffs in 14 seasons. Erickson's compensation for his fourth and final year at Idaho was $47,940. Erickson was introduced as the head coach of the Division I-A Wyoming Cowboys on December 2, 1985. His four-year contract included a base annual salary of $60,000 plus $20,000 from radio and television, and the rent-free use of a home in Laramie. The Cowboys had just concluded 3-8 season in 1985, tied for seventh in the nine-team WAC. He installed his "Air Express" form of the spread offense and led the Cowboys to 3–1 start in September, with road wins at Air Force and Wisconsin. Wyoming finished at 6–6 season in 1986, tied for fourth in the WAC with a 4–4 record. He left Wyoming without notice after accepting the head coaching job at Washington State in early January. When Erickson was introduced as the head coach of the Washington State Cougars of the Pac-10 on January 7, 1987, he stated that it was his lifelong goal to be the head coach at WSU. His contract at WSU in 1987 was a five-year deal at an annual base salary of $70,000, with up to $30,000 from radio, television, and speaking engagements. He returned to the Palouse after just 13 months in Wyoming, then led the Cougars to 3–7–1 in his first year, the same record the Cougars had the year before under Jim Walden. Erickson turned around the Washington State program quickly, going 9–3 in 1988 with a post-season victory in the Aloha Bowl, WSU's first bowl win since the 1916 Rose Bowl. Erickson's continued success led to his hiring by the University of Miami in March 1989, although a week before he stated he was not leaving WSU. Expectations were very high at Miami, as Erickson replaced the successful Jimmy Johnson, who had led the Hurricanes to ten or more wins each the previous four seasons and a national championship in 1987 before departing for the NFL's Dallas Cowboys. Erickson led Miami for six seasons (1989–1994), winning national championships in 1989 and 1991. That gave Erickson more national championships than any other Miami coach. Erickson's 0.875 winning percentage (63–9) at Miami remains the highest in the history of the program. However, his 1993 team went 9–3, the first season with fewer than ten wins for Miami since 1985, and lost its bowl game 29–0 to Arizona. In September 1994, the Hurricanes lost, 38–20, to Washington at the Orange Bowl, snapping the Canes' NCAA record 58-game home win streak. Moreover, in 1991 Miami self-reported rampant violations of NCAA rules dating back to 1985. However, when it emerged that an academic adviser had helped players fraudulently obtain Pell Grants, the federal government asked Miami to stop its probe so the Department of Education could conduct an investigation of its own. Ultimately, Miami was placed on three years' probation not long after Erickson left the school, banned from postseason play in 1995 and docked 31 scholarships over three years. Erickson himself was not implicated in wrongdoing. Erickson was interviewed about his time at the University of Miami for the documentary The U, which premiered December 12, 2009, on ESPN. After turning down offers from both the Denver Broncos and Philadelphia Eagles, Erickson accepted an offer to coach the Seattle Seahawks in January 1995 for about $1 million per year, compared to the estimated $700,000 in his final year at Miami. In his first season, he switched starting quarterbacks from the #2 overall pick in the 1993 NFL Draft, Rick Mirer, and went to John Friesz, whom he recruited to Idaho in 1985. Friesz guided the Seahawks to their second  biggest comeback win ever in a game, rallying from 20–0 down at the half after Mirer had started, and took the Seahawks to the final week of the season with an 8–7 record after starting 2–6 and a playoff berth on the line only to lose to Kansas City and finish 8–8. In 1996, the Seahawks finished 7-9, Erickson's worst record with the team. 1997 saw an ownership change in Seattle, in which Microsoft co-founder Paul G. Allen purchased the team from then owner Ken Behring and helped pass a referendum for a new stadium to be built, that season, the Seahawks had one of the best passing offenses in the league, only to finish 8–8 after an 0–2 start in which they were outscored 76–17 in two home losses. After the season, Erickson, who had been told by new owner Paul Allen that he would return in 1998 had to fire longtime friend and assistant the special teams coach Dave Arnold and replace him with Pete Rodriguez. With a revamped lineup led by 1997 passing leader Warren Moon the Hawks flew out of the gate in 1998 with three-game winning streak (including a Kickoff Weekend shutout of the Eagles at Veterans Stadium) but stumbled and lost their next three games. Later in the year, with the team playing at .500 he turned to Jon Kitna to lead the offense and they responded with a close win at home against the Tennessee Oilers before going on the road to New York to play the Jets. In a hotly contested game that many viewed as the best combined offensive performances of 1998, the game came down to a blown call on a short touchdown run by Jets quarterback Vinny Testaverde (where he was ruled to have scored despite replay evidence clearly showing his forward progress had been stopped short of the goal line) which cost Seattle the game and Erickson his job. This game would be cited as one of the main reasons the NFL restored its instant replay review system following the season. The final year of Erickson's NFL contract for 1999 was valued at $1.3 million. In January 1999, Erickson returned to the college ranks when he was hired at Oregon State University, a five-year contract at $300,000 per year The Oregon State Beavers had become one of three perennial "cellar dwellers" in the Pacific-10 Conference. Expectations were so low that Erickson's predecessor, Mike Riley, was promoted to an NFL head coaching position with the San Diego Chargers after leading the Beavers to a 5–6 record. In his first season, Erickson directed the Beavers to a 7–5 record, the program's first winning season in 29 years. They secured an invitation to the 1999 Oahu Bowl—their first bowl appearance in 35 years. The following year, Oregon State went 11–1, snapped a 33-year losing streak to the USC Trojans, and earned a share of the Pac-10 conference championship for the first time since the conference expanded to ten teams in 1978. It was the first time the Beavers won at least a share of a conference championship since 1964. Oregon State began to develop a national reputation for its high-powered offense and a swarming defense. In fact, the team barely missed an invitation to play in the national BCS title game due to a late-in-the-game missed field goal against Washington. The win over USC did, however, help Erickson's crew clinch a spot in the Fiesta Bowl against the Notre Dame Fighting Irish—the Beavers' first major-bowl appearance since the 1965 Rose Bowl. Oregon State won the bowl game 41–9, in what is generally considered to be one of Erickson's crowning career achievements. At the close of the 2000 season's bowl games, the Beavers were ranked fourth nationally in the Associated Press top 25 College Football Poll, their highest final ranking in school history. Some media outlets suggested Oregon State would have been a favorite to win the BCS Championship at the Orange Bowl had they been selected. Before the 2001 season, Sports Illustrated ranked Oregon State as the number one team in the nation. However, a lack of returning talent from the 2000 team took its toll, and the Beavers went 5–6. Among the players who hail from Erickson's high-octane 2000 team are NFL stars Chad Johnson and T. J. Houshmandzadeh. Both were selected in the 2001 NFL Draft by the Cincinnati Bengals. Erickson was named Sporting News National Coach of the Year in 2000. His name also came up for several high-profile college football positions. In late 2000, Erickson was a primary choice to fill the vacant position at USC, however he spurned a $7.2 million, five-year contract to remain with the Beavers, and the position eventually went to Pete Carroll. Erickson remained coach at Oregon State for four seasons (1999–2002) before accepting another coaching position in the NFL. His early departure left some OSU fans angry with him for not finishing-out his contract, but he is still credited with playing a leading role in reviving the Beavers football program. Mike Riley returned to Corvallis to succeed Erickson as head coach in 2003. Erickson returned to the NFL in February 2003 with the San Francisco 49ers, and received a five-year contract at $2.5 million per year. The Niners had serious salary cap problems, and Erickson lasted just two seasons before being fired, along with general manager Terry Donahue, after a 2–14 season in 2004. The hiring of Erickson was very surprising and highly criticized by the fans and the media after a longer-than-usual coaching search to replace the fired coach Steve Mariucci. This move was the first strong indicator that the fans believed that John York was not cut out to be the owner of the team after taking over the franchise from his brother-in-law Edward J. DeBartolo, Jr. in 2000. The search began without much direction and several candidates in the coaching search withdrew from consideration. When the 49ers had reportedly named their finalists, three defensive coordinators were named. But the offensive-minded Erickson ended up being hired and due to the timing of the hiring, Erickson did not have the time to properly assemble his coaching staff. The 49ers' offense had mostly players who specialized in the West Coast Offense that Mariucci ran. But the aggressive style of offense that Erickson is known for deviated greatly from that scheme and the hybrid scheme that Erickson tried to employ in order to maintain parts of the West Coast Offense and ease the transition to his offense never worked out. After two seasons, Erickson was fired with three years remaining on his contract; he did not coach during the 2005 season. On February 8, 2006, the University of Idaho announced the re-hiring of Erickson as its head football coach. Erickson had won 32 games in his first four seasons as a head coach (1982–85) to establish Idaho as a top I-AA program in the Big Sky Conference. The Vandals moved up to Division I-A in 1996 but had not had a winning season since 1999. Idaho had just completed its first season in the WAC in 2005 when previous head coach Nick Holt resigned in early February, after just two seasons. He left to take a higher paying assistant's job in the NFL, as the defensive line coach for the St. Louis Rams under new head coach Scott Linehan, a former Vandal quarterback and offensive coordinator. After a few days, Holt reconsidered and accepted another job back at USC, as defensive coordinator under Pete Carroll for even more money, more than double his salary at Idaho. When asked at his introductory press conference if Idaho was indeed a long-term arrangement, Erickson responded, "You want to look at the age on my driver's license?...This, hopefully, is going to be my last job." Erickson's rejuvenated 2006 Vandals broke to a 4–3 record and were and 3–0 in the WAC, then lost the final five conference games to finish at 4–8 overall and sixth in the WAC. Erickson was paid $215,000 by Idaho and nearly $2.3 million by the 49ers for the fourth year of his NFL contract. After just ten months back at Idaho, Erickson left again for the opportunity to lead his fourth BCS program. Arizona State athletic director Lisa Love hired him on December 9 to replace recently fired Dirk Koetter, who had finished the 2006 regular season at 7–5. Arizona State was Erickson's third head coaching stint in the Pac-10, after Washington State and Oregon State. Arizona State paid $2.8 million to Koetter and a $150,000 buyout to Idaho to complete the hiring of Erickson to a five-year contract. He immediately paid dividends at ASU, leading the Sun Devils to a 10–2 regular season record in 2007, a share of the Pac-10 title, and a berth in the Holiday Bowl. Erickson was named the Pac-10 Coach of the Year; the first to ever win the award at three different Pac-10 schools. He also coached another major award winner; placekicker Thomas Weber was named the Lou Groza Award winner. Erickson worked for the relatively low salary of $500,000 from ASU in his first season, with another $2 million paid by the 49ers for the last year of his NFL contract. The remaining four years of the original ASU contract paid $1.275 million per year. In 2008 the Arizona Board of Regents had approved a contract extension to keep Erickson at Arizona State through June 2012. Erickson's early success at ASU was not sustained, as the Sun Devils failed to have another winning season and lost three of four Territorial Cup rivalry games against Arizona. In his final four seasons, Erickson was 21–28 overall and 14–22 in conference. After opening the 2011 season with a promising 6–2 record, Arizona State suffered four straight Pac-12 defeats in November to end the regular season, and Erickson was fired on November 28. He was allowed to coach in their bowl game on December 22, but ASU was soundly beaten 56–24 by Boise State in the Maaco Bowl in Las Vegas for their fifth consecutive loss. In February 2013, Erickson came out of retirement to join the staff at the University of Utah as the co-offensive coordinator with Brian Johnson under head coach Kyle Whittingham. In announcing the hire, Erickson is quoted "Being around football players and coaches has been my life and that's why I am coming out of retirement, I will do whatever I can to help the players and coaches at Utah be successful and I am excited to get back out on the football field." Erickson retired on December 30, 2016 after 47 years of coaching. In 2018, Erickson was named the head coach of the Salt Lake Stallions, a team part of the Alliance of American Football, set to play in 2019. On April 2, 2019 the AAF suspended operations, and went bankrupt on April 17. Erickson and his wife, Marilyn, have two sons: Bryce and Ryan. Erickson hired Bryce to the Arizona State staff, as a graduate assistant for first two seasons. In 2012, Bryce became the head coach at South Albany High School in Albany, Oregon. Later that year, he was hired as an assistant coach for Idaho. †Indicates Bowl Coalition, Bowl Alliance or BCS bowl. ^ Bonagura, Kyle (December 30, 2016). "Dennis Erickson, Utah assistant and former Miami head coach, retiring". espn.com. ^ a b Genessy, Jody (May 16, 2018). "Dennis Erickson to coach Utah pro team in new Alliance of American Football". DeseretNews.com. Retrieved September 12, 2018. ^ "WSU hires Montana assistant". Lewiston Morning Tribune. (Idaho). Associated Press. January 23, 1968. p. 8. ^ Ramsdell, Paul (September 30, 1982). "Friendly enemies". Lewiston Morning Tribune. (Idaho). p. 1C. ^ "Bobcat offense's 'big three'". Spokesman-Review. (Spokane, Washington). (photo). October 4, 1967. p. 16. ^ "SAE NC Chi - Wake Forest University - History of ΣΑΕ". www.saewfu.com. Retrieved September 12, 2018. ^ "Dennis Erickson, Don Hass pace MSU in All-Big Sky". Spokesman-Review. (Spokane, Washington). November 30, 1967. p. 21. ^ Rock, Brad (May 26, 2018). "Dennis Erickson hopes to make history in new league, not teach it". DeseretNews.com. Retrieved September 12, 2018. ^ "Idaho assistant grid coach to join Sweeney at Fresno". Lewiston Morning Tribune. (Idaho). December 20, 1975. p. 3B. ^ "Regents okay Erickson salary". Lewiston Morning Tribune. (Idaho). January 15, 1982. p. 4C. ^ Missildine, Harry (December 12, 1981). "Erickson's 'bowling' date comes before Vandals". Spokane Daily Chronicle. (Washington). p. 12. ^ College Football Data Warehouse Archived July 3, 2009, at the Wayback Machine - Idaho opponents - Boise St.
^ Grummert, Dale (January 8, 1987). "Erickson sets lofty goals for Cougars". Lewiston Morning Tribune. (Idaho). p. C1. ^ a b Bergum, Steve (February 27, 1989). "Erickson says he'll stay put". Spokesman-Review. (Spokane, Washington). p. C1. ^ Bergum, Steve (March 6, 1989). "Erickson's air express off to Miami". Spokesman-Review. (Spokane, Washington). p. A1. ^ Meehan, Jim (March 6, 1988). "Erickson leaves 'dream'". Idahonian. (Moscow). p. 1A. ^ "Erickson takes Miami job". Eugene Register-Guard. (Oregon). Associated Press. March 6, 1989. p. 1D. ^ "1995 Public Infraction Report". NCAA.org. Retrieved November 11, 2006. ^ Scheibe, John (December 4, 2009). "'The U' is the latest film from ESPN". Los Angeles Times. Retrieved September 13, 2018. ^ "Seahawks complete biggest comeback in franchise history, beat Buccaneers 27-24". Q13 FOX News. ^ David Wharton, All Signs Point to Carroll, Los Angeles Times, December 14, 2000, Accessed July 15, 2008. ^ David Wharton, Another USC Turnover, Los Angeles Times, November 28, 2000, Accessed July 16, 2008. ^ "online video - channel 12 news video - arizona republic video - phoenix video". azcentral.com. ^ "Dennis Erickson to help as Utah Utes coordinator". USA TODAY. February 11, 2013. ^ Grummert, Dale (April 17, 1988). "Marilyn Erickson knows the feeling too well". Lewiston Morning Tribune. Idaho. p. D1. ^ "Dennis Erickson". Arizona State Sun Devils. Archived from the original on October 28, 2012. ^ Sowa, Jesse (August 29, 2012). "Dennis Erickson never far from the game". Corvallis Gazette-Times. (Albany Democrat-Herald). Retrieved September 2, 2012. ^ Sowa, Jesse (December 5, 2012). "Bryce Erickson heading to the University of Idaho". Albany Democrat-Herald. Retrieved December 5, 2012. ^ "Dennis Erickson NFL Record, Statistics, and Category Ranks". Pro-football-reference.com. Retrieved July 20, 2012. "Out of Everett," The Seattle Times' Pacific Magazine, Sunday, August 13, 1995, p. 12-17. The 1986 Wyoming Cowboys football team represented the University of Wyoming in the 1986 NCAA Division I-A football season. A charter member of the Western Athletic Conference (WAC), Wyoming played its home games in War Memorial Stadium, an outdoor facility on campus in Laramie, Wyoming. 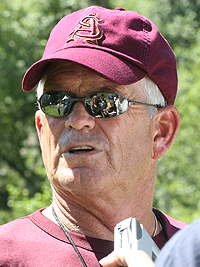 The Cowboys were led by head coach Dennis Erickson, in his only season at Wyoming, and finished with a record of six wins and six losses (6–6, 4–4 WAC). The Cowboys' offense scored 299 points while the defense allowed 272 points. The 1987 Washington State Cougars football team was an American football team that represented Washington State University in the Pacific-10 Conference (Pac-10) during the 1987 NCAA Division I-A football season. In their first season under head coach Dennis Erickson, the Cougars compiled a 3–7–1 record (1–5–1 against Pac-10 opponents), finished in ninth place in the Pac-10, and were outscored by their opponents by a combined total of 356 to 238.The team's statistical leaders included Timm Rosenbach with 2,446 passing yards, Richard Calvin with 822 rushing yards, and Steve Broussard with 701 receiving yards. The 1988 Eagle Aloha Bowl was a college football bowl game, the fourth of seventeen in the bowl season of the 1988 NCAA Division I-A football season. The seventh edition of the Aloha Bowl, it was played on December 25 at Aloha Stadium in Honolulu, Hawaii. The game matched the #14 Houston Cougars of the Southwest Conference against the #18 Washington State Cougars of the Pacific-10 Conference. Underdog Washington State scored all of its points in the second quarter and forced a last-second Houston turnover in notching a 24–22 win on Christmas Day. The bowl appearance was Washington State's second of the 1980s and was the first bowl victory for Washington State since the 1916 Rose Bowl. This was the final game for head coach Dennis Erickson at WSU; he left for the University of Miami in March. Washington State climbed up to sixteenth in the final AP poll, and Houston dropped to eighteenth. The 1988 Washington State Cougars football team was an American football team that represented Washington State University in the Pacific-10 Conference (Pac-10) during the 1988 NCAA Division I-A football season. In their second season under head coach Dennis Erickson, the Cougars compiled a 9–3 record (5–3 against Pac-10 opponents), finished in a tie for third place in the Pac-10, and outscored their opponents by a combined total of 415 to 303. On October 29, Washington State beat No. 1 UCLA at the Rose Bowl, their first and only win ever over a No. 1 ranked team. The team's statistical leaders included Timm Rosenbach with 3,097 passing yards, Steve Broussard with 1,280 rushing yards, and Tim Stallworth with 1,151 receiving yards. The 1989 Miami Hurricanes football team represented the University of Miami during the 1989 NCAA Division I FBS football season. It was the Hurricanes' 64th season of football. The Hurricanes were led by first-year head coach Dennis Erickson and played their home games at the Orange Bowl. They finished the season 11–1 overall. They were invited to the Sugar Bowl where they defeated Alabama, 33-25, to win the school's 3rd national championship. The 1993 Miami Hurricanes football team represented the University of Miami during the 1993 NCAA Division I FBS football season. It was the Hurricanes' 68th season of football and 3rd as a member of the Big East Conference. The Hurricanes were led by fifth-year head coach Dennis Erickson and played their home games at the Orange Bowl. They finished the season 9–3 overall and 6–1 in the Big East to finish in second place. They were invited to the Fiesta Bowl where they lost to Arizona, 29-0. The 1994 Miami Hurricanes football team represented the University of Miami during the 1994 NCAA Division I FBS football season. It was the Hurricanes' 69th season of football and 4th as a member of the Big East Conference. The Hurricanes were led by sixth-year head coach Dennis Erickson and played their home games at the Orange Bowl. They finished the season 10–2 overall and 7–0 in the Big East to finish as conference champion. They were invited to the Orange Bowl, which served as the Bowl Coalition National Championship Game, where they lost to Nebraska, 24-17. The 1999 Oregon State Beavers football team represented Oregon State University in the 1999 NCAA Division I-A football season. They were led by head coach Dennis Erickson. This season marked Oregon State's first winning season in 28 years. The 2000 Oregon State Beavers football team represented Oregon State University in the 2000 NCAA Division I-A football season. The Beavers played their home games at Reser Stadium in Corvallis, Oregon and were led by head coach Dennis Erickson. The 2000 season was arguably the greatest season in OSU's football history. They finished the regular season at 10–1 (7–1 Pac-10), and shared the Pac-10 title with Washington and Oregon–their first conference title since 1964. Only a loss to Washington kept the Beavers out of the Rose Bowl and their first outright conference title since 1956. They defeated Notre Dame 41–9 to win the Fiesta Bowl. The 11 wins is an Oregon State record for wins in a single season. The 2001 Oregon State Beavers football team represented Oregon State University in the 2001 NCAA Division I-A football season. They were led by head coach Dennis Erickson. The 2002 Oregon State Beavers football team represented Oregon State University in the 2002 NCAA Division I-A football season. Led by head coach Dennis Erickson, the Beavers lost the 2002 Insight Bowl. The 2011 Sun Devils football team represented Arizona State University in the 2011 NCAA Division I FBS football season. The team was coached by fifth year head coach Dennis Erickson and played their home games in Sun Devil Stadium in Tempe, Arizona. They are a member of the South Division of the Pac-12 Conference. They finished the season 6–7, 4–5 in Pac-12 play to finish in a tie for third place in the South Division. They were invited to the Maaco Bowl Las Vegas where they were defeated by Boise State. At the end of the regular season, head coach Dennis Erickson was fired. He stayed on to coach in the Sun Devils bowl game and finished with a five-year record of 31–31. The Arizona State Sun Devils football team represents Arizona State University in the sport of American football. The Sun Devils team competes in the Football Bowl Subdivision (FBS) of the National Collegiate Athletic Association (NCAA) and the South Division of the Pac-12 Conference (Pac-12). Arizona State University has fielded a football team since 1897. The Sun Devils are currently led by head coach Herm Edwards and play their home games at Sun Devil Stadium in Tempe, Arizona. The Sun Devils have won seventeen conference titles, including three Pac-12 titles.A number of successful and professional football players once played for ASU. The school has 3 unanimous All-Americans and 16 consensus selections. Among the most lauded players the school has produced are Pat Tillman, Terrell Suggs, Mike Haynes, Darren Woodson, Charley Taylor, and John Henry Johnson. In addition to its players, ASU's football program has had several notable head coaches, including Hall of Famers Dan Devine and John Cooper and national champion Dennis Erickson. The all-time school wins leader is Hall of Fame coach Frank Kush, for whom Frank Kush Field at Sun Devil Stadium is named. Kush also consistently led the Sun Devils to victory against the Arizona Wildcats, ASU's traditional rival, losing to the Wildcats only twice between 1963 and 1979. Jonathan Charles Smith (born January 18, 1979) is an American college football coach who is currently the head coach at Oregon State University. He was previously the co-offensive coordinator and quarterbacks coach for the Washington Huskies. He arrived in Seattle in 2014 as part of the staff of new head coach Chris Petersen. As a player, he was a four-year starter at quarterback at Oregon State in Corvallis. Smith was previously the quarterbacks coach for two seasons at Boise State, also under Petersen, and the offensive coordinator for two seasons at Montana. He was the quarterbacks coach for six seasons (2004–2009) at Idaho under three head coaches: Nick Holt, Dennis Erickson, and Robb Akey. Prior to his tenure with the Vandals in Moscow, Smith was a graduate assistant at his alma mater in 2002 and 2003 under Erickson and Mike Riley. The Arizona State Sun Devils football team competes in the National Collegiate Athletic Association (NCAA) Division I Football Bowl Subdivision, representing Arizona State University. The Oregon State Beavers football team represents Oregon State University in NCAA Division I FBS college football. The team first fielded an organized football team in 1893 and is a member of the Pac-12 Conference's North Division. Jonathan Smith has been the head coach since November 29, 2017. Their home games are played at Reser Stadium in Corvallis, Oregon. The Salt Lake Stallions were a professional American football team based in Salt Lake City, and one of the charter members of the Alliance of American Football (AAF), which began play in February 2019. The Stallions were the northernmost team in the AAF, as the league's only franchise north of the 35th parallel. The team's head coach was Dennis Erickson, owner of a 179–96–1 record coaching college football and a 40–56 record coaching in the NFL. On April 2, 2019, the league's football operations were reportedly suspended, and on April 4 the league allowed players to leave their contracts to sign with NFL teams. The league filed for Chapter 7 bankruptcy on April 17, 2019. The State of Washington Sports Hall of Fame is a sports hall of fame honoring athletes associated with the U.S. state of Washington. There have been 195 individuals inducted into the hall since 1960. Members' plaques are displayed in the Shanaman Sports Museum located in the Tacoma Dome in Tacoma, Washington. The eight inductees in its 2017 class were Dennis Erickson, Mike Holmgren, Curt Warner, Gary Wright, Kasey Keller, Debbie Armstrong, Joe Steele, and Byron Beck. The Washington State Cougars football program is the intercollegiate American football team for Washington State University, located in the U.S. state of Washington. The team competes at the NCAA Division I level in the FBS and is a member of the North Division of the Pac-12 Conference (Pac-12). Known as the Cougars, the first football team was fielded in 1894. The Cougars play home games on campus at Martin Stadium in Pullman, Washington, which opened in 1972; the site dates back to 1892 when it was called Soldier Field. Its present seating capacity is 33,522. Their main rivals are the Washington Huskies. The Cougars and Huskies historically end each regular season with the Apple Cup rivalry game in late November. They are currently coached by Mike Leach.